GRAMPS is a genealogy software based on GTK for Linux, Windows and FreeBSD that allows you to easily build and keep track of your family tree. 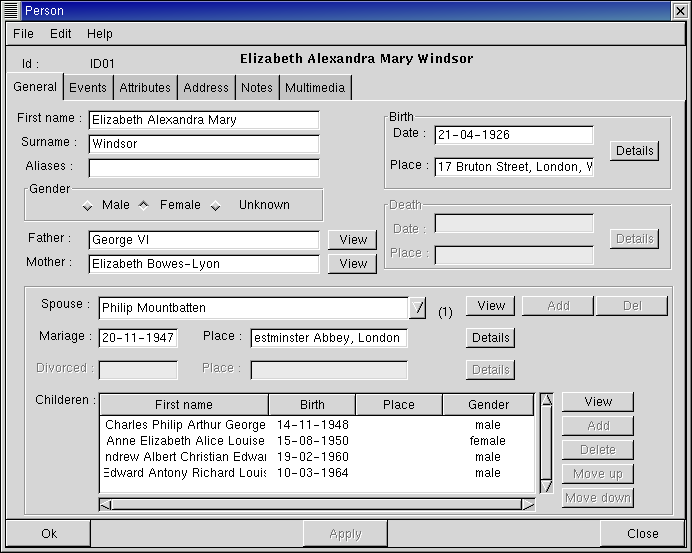 FTree is an X-windows software program to store and display family tree genealogy information. 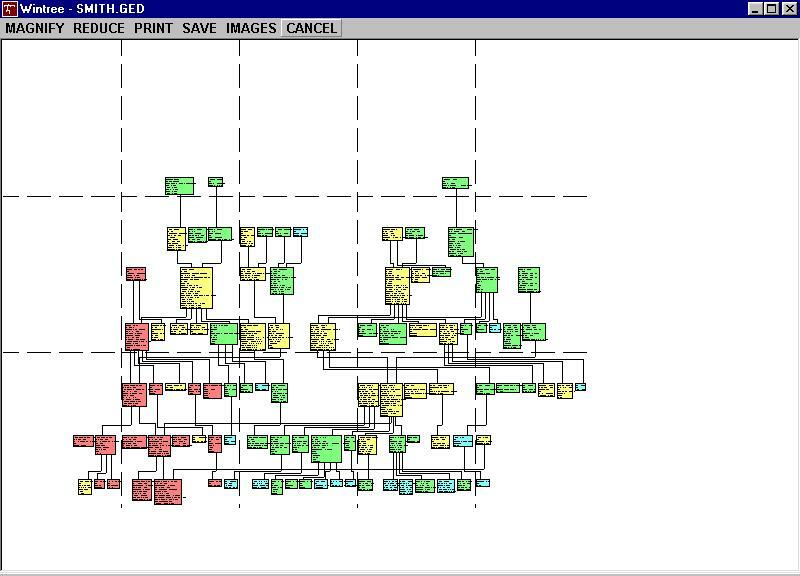 GeneWeb is a genealogy software program with a Web interface. It can be used off-line or in a Web environment. 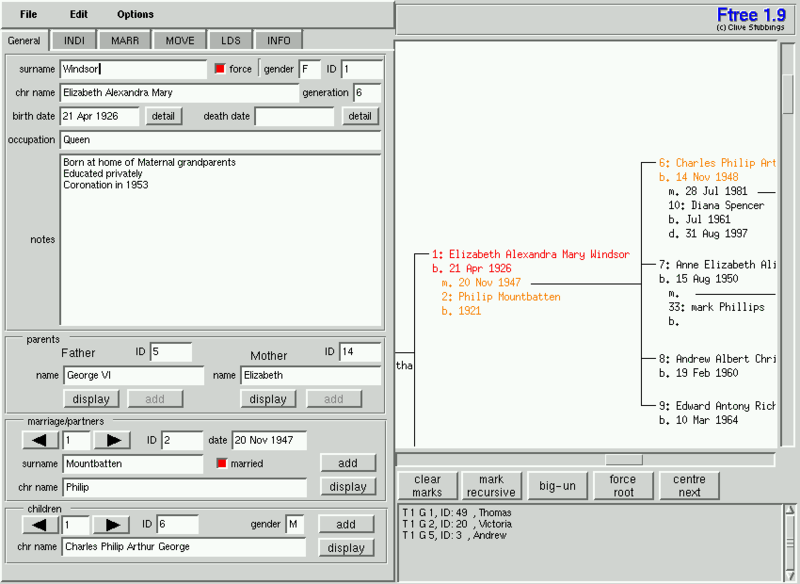 LifeLines is a genealogy software for Linux to help with your family history research. GWintree provides GEDCOM-based facilities to record, view, edit and merge genealogical data, and to produce reports, family trees, and other charts. GenealogyJ is a viewer and editor for genealogic data, suitable for hobbyist, family historian and genealogy researcher. It runs on Linux and other platforms. phpmyfamily is a dynamic genealogy website builder software which allows geographically dispersed family members to maintain a central database of research. GDBI is a genealogy program integrator for Linux and other platforms. It is free software under the GPL and MIT License. Geneotree is a genealogy software developped in PHP & MySQL. It is a dynamic application which uses gedcom files. It runs on all systems using PHP, including Linux. Retrospect-GDS is an easy to use software application for Linux for displaying your genealogy information on the web. Genes is a personal genealogy software application for use on (primarily) Linux systems.